There are 4G Sleek vehicle solutions for the exciting new technology of 4G. The Sleek is a cradle with built-in amplifier and interior antenna requiring a device to be directly placed onto a cellular cradle to receive the improved signal. All of the 4G Sleek variants available can also work to boost the signal for 3G/EDGE to improve call quality (can work for all North American 2G/3G technologies except iDEN or WiMax) as well as 4G LTE. All of these cradle boosters (with the exception of 4G-C) is available in three varieties. The first does not include an exterior antenna allowing for flexibility and choice, the second includes a 4-inch magnet-mount exterior antenna (301126) and the third includes a 4-inch magnet-mount exterior antenna and the Sleek Home Accessory Kit (859970). The Sleek 4G (813425 [discontinued], 813426, 813426-H) is the most versatile option available. It can work to improve 4G LTE data speeds for all major North American carriers. The Sleek 4G enables user to manually switch between AT&T’s 4G and Verizon’s 4G bands. This high-end amplifier is ideal for customers with multiple devices operating on multiple networks or customers anticipating switching between networks in the near future. The Sleek 4G-V (815125, 815126, 815126-H) is capable of enhancing the cellular signal for Verizon's 4G LTE network as well as the 3G/EDGE signal for every North American cellular network (except iDEN, WiMax). This cellular signal boosting solution ideal for any Verizon customer it can improve the call quality and data speeds of the Verizon network. The Sleek 4G-A (815325, 815326, 815326-H) is designed to improve the cellular signal for AT&T's 4G LTE. Along with AT&T 4G, it can also improve the cellular signal for all North American 3G/EDGE (except iDEN, WiMax). It is capable of maximizing data speeds for the AT&T network and improving call quality making it the perfect accessory for AT&T customers. Sleek 4G-C (812726F, 812726F-H) can improve the 4G LTE cellular signal for all major Canadian cellular networks including Rogers, Telus, Bell Mobility. Furthermore, it can also improve the cellular signal for 3G/EDGE for all networks within North America (except iDEN, WiMax). It provides for the ability to maximize data speeds (regardless of whether or not 4G LTE is available to a customer) as well as improve call quality for customers of major Canadian networks. A Sleek Home Accessory Kit (859970) is available to allow for the Sleek to work in an indoor setting. 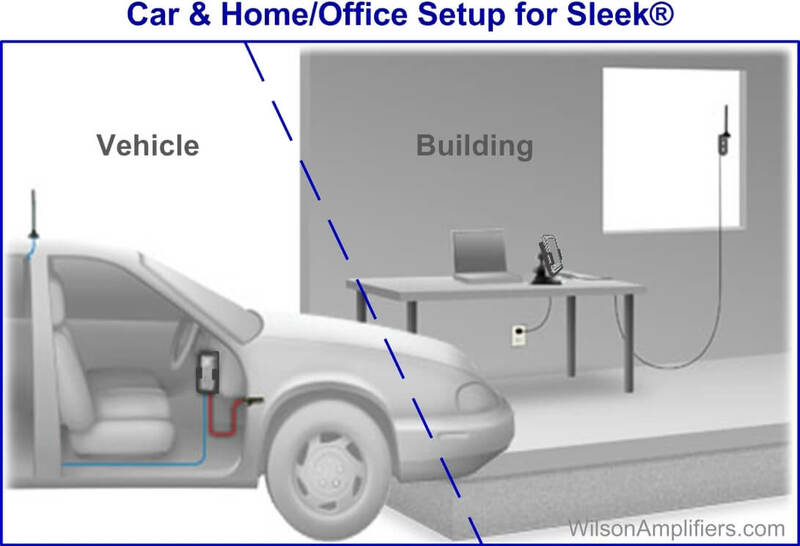 The Sleek is very easy to install and remove and could easily be moved between a vehicle, home, office, hotel room or other setting. This kit includes a 13 inch zippered carrying pouch (859946) to easily transport the Sleek and all components between different settings and an adjustable desk mount (901137) to allow for the Sleek to be placed onto a desk. It also includes a window bracket for the outside antenna (901128) which includes a long radial to ensure that the antenna does not interfere with other antennas and suction cups to attach the outside antenna onto a window and an AC power supply for the Sleek (859969). The Sleek combines affordability and power with attractive and practical design. The Sleek amplifier is designed for single-user, hands-free calling since the signal boosting only occurs while the phone is physically placed inside the cradle arms. It is intended for Bluetooth hands-free, wired hands-free, or speakerphone operation only. The Sleek’s compact design is based on the amplifier unit being built-in the actual cradle. A Sleek solution consists of an exterior antenna to pull the cellular signal and the cradle amplifier to improve the boosted signal. This particular model is capable of improving 3G/EDGE signal for all North American networks (except iDEN, WiMax). There are three Sleek kits, two (815226, 815226-H) which are fully plug-and-play and the other (815225) requires the separate purchase of an exterior antenna. The 815226 includes the Sleek cradle and 4-inch magnet mount antenna (301126). The 815226-H includes the 815226 and the Sleek Home Accessory Kit (859970). The 815225 includes the Sleek cradle allowing for the choice of exterior antenna. It has an SMA-Female port to connect to an exterior antenna. 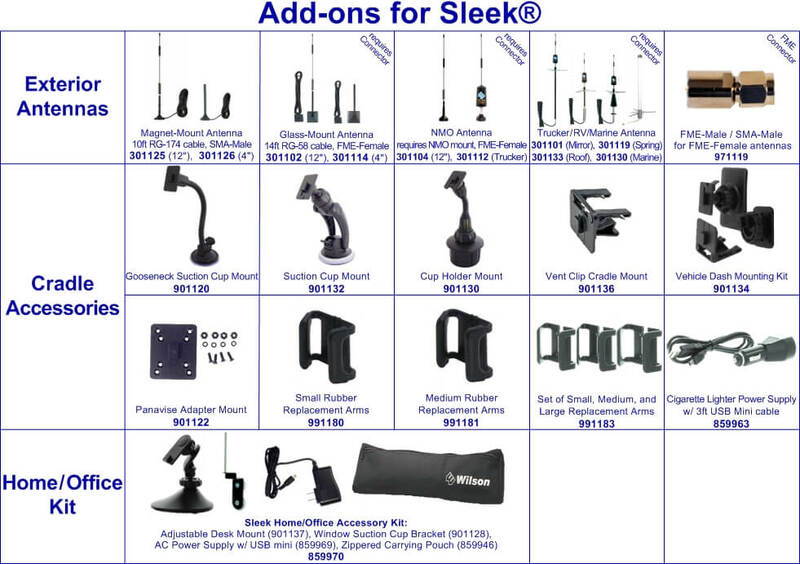 Sleek Home Accessory Kit (859970) is an item which takes advantage of the portability of the Sleek family. 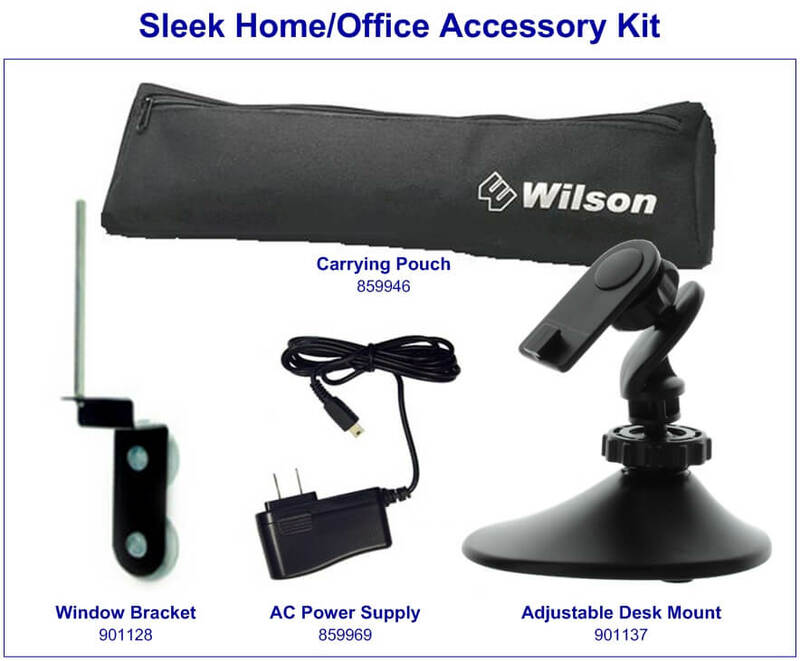 This kit includes is a suction cup window bracket mount (901128) for the exterior antenna with a long radial to stop potential interference between exterior antenna and the built-in antenna on the cradle, an adjustable desk mount (901137), an AC power supply (859969) and a carrying pouch (859946). The Sleek is designed for easy, user-friendly installation and fast car-to-home/office mobility.